One of the most missed configuration issue when installing Oracle Database on Windows systems is failure to configure the Loopback adapter prior to installing the software on DHCP clients. Many Oracle products such as Database Control, Database Listener, Weblogic Server either standalone or bundled in JDeveloper use the machine IP address and or host name during the installation and may fail to function properly when either changes. You can prevent this issue by configuring the Loopback Adpater on your DHCP machine prior to installing Oracle products. This document will detail the setup and configuration on Windows hosts in particular this install was done on Windows 7 Ultimate. Run the Command Prompt using Run As Administrator and enter hdwwiz.exe to start the Add Hardware Wizard. 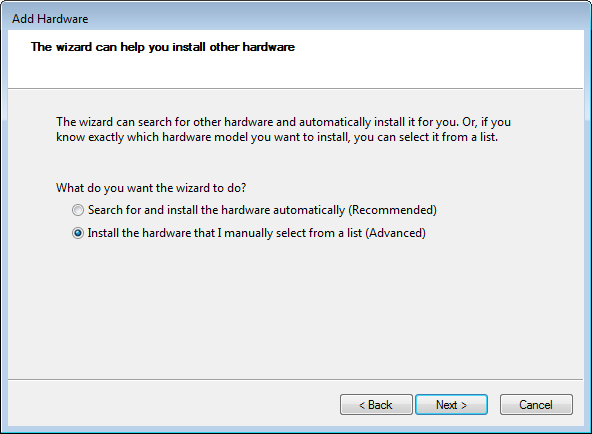 Select the “Instal the hardware that I manually select from a list (Advanced)” and click the Next button to continue. Scroll down and select Network adapters and click the Next button. 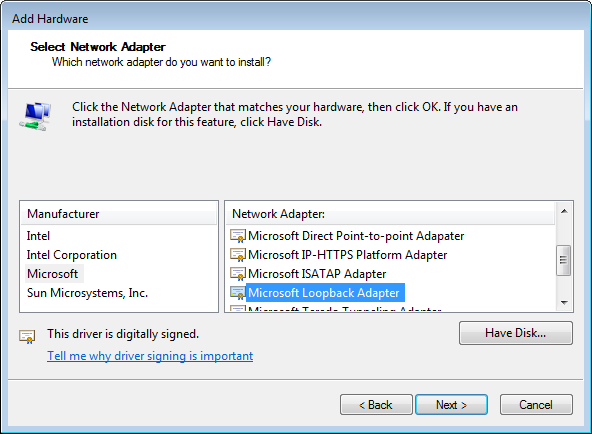 On the Select Network Adapter screen select Microsoft for the Manufacturer and select Microsoft Loopback Adapter for the Network Adapter. Click the Next button to continue. 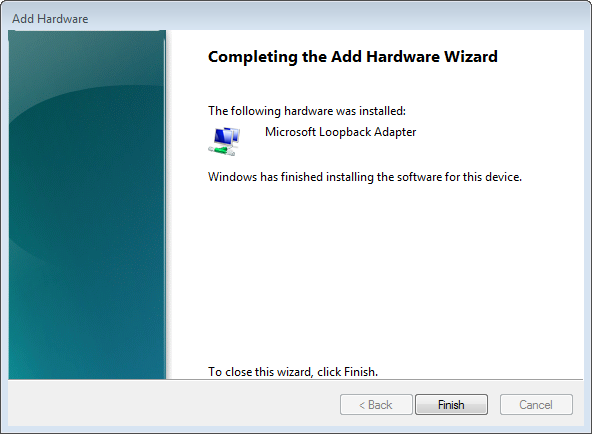 On the confirmation screen click the Next button to install the Microsoft Loopback Adapter. 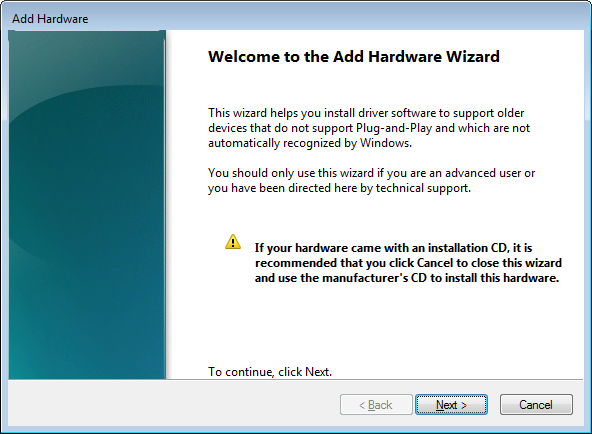 Once the installation is complete click the Finish button to exit the Add Hardware Wizard. Now we need to configure the adapter. In the Control Panel open the Network and Sharing Center. Click the Change adapter settings on the left hand side of the panel. 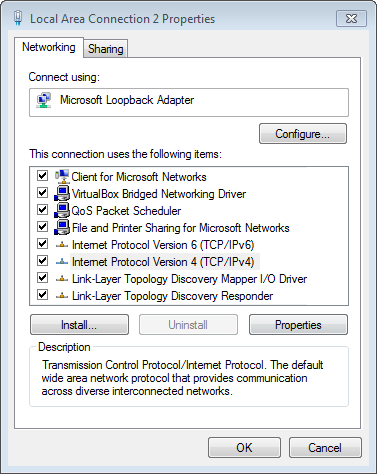 On the Network Connections screen select Local Area Connection with the type of Microsoft Loopback Adapter. Right click the adapter and select properties. On the Properties pages select Internet Protocol Version 4 (TCP/IPv4) and click the Properties button. On the Internet Protocol Version 4 (TCP/IPv4) Properties page enter IP information for an IP address in one of the private address space (10.x.x.x , 172.16.x.x or 192.168.x.x). Care should be taken when choosing your address that it is also not in the same address range as your work or home network settings. Once you have entered the IP information click the OK button to continue. You will be taken back to the Properties page for the Local Area Connection, click the Close button to finalize the changes. The last thing we need to do to complete this to add an entry to the hosts file. The hosts file in Windows can be found in C:\Windows\System32\drivers\etc\. Back in the command prompt that was opened as the administrator bring up Notepad like below. Add a line at the bottom that includes the IP address you added for the Loopback Adapter along with the name of the machine. Once you are done, save and exit notepad. With all of that complete you should now be able to ping by name successfully. Having the Loopback Adapter installed and configured on a machine that used DHCP prior to installing Oracle products will save you a lot of headache when the IP or host name of the machine changes when you change networks. you rock, thanks a bunch. Thank you Eric…This is really excellent article. What steps are required if using Home WiFi setup ? The steps are the same if you are using your Home WiFi setup. You are not changing either your wired or wireless connections. 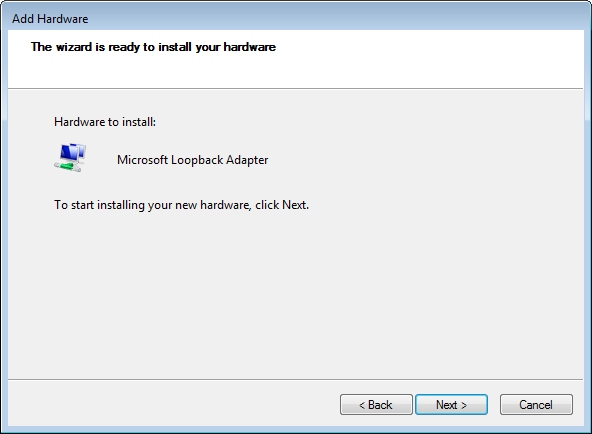 When adding the loopback adapter you are adding another network device. command, wireless adapter will be first in the list. This article is better than documentation in Oracle. Oracle left out details in a step. Thanks man, was giving up on installing 11g on Win 7. But this even works with 10g. Excellent presentation. Thanks. It is useful to me. If I change my hosts file to redirect the PC name MSC11WST0238, how will you guarantee other NON-Oracle things will work? This is pretty much interfering with my network administrator and his policies. If something stops working the first thing people do is “ping HOSTNAME” to check if the IP address is setup correctly in our domain. When they see 192.168.4.1 they will start asking questions. I think this is somehow wrong. The following hardware was not installed. An error accrued during the installation of the device . please if somebody have an idea he could help me???? error is giving me that multipoint server loopback adapter must be enable . 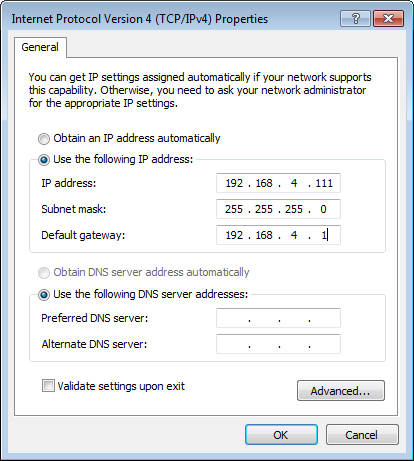 After Loop back Adapter is installed and configured as described in Windows 8, ping is not considering static IP that is configured in IPV4 but IT IS PINGING IPV6 address. Please help on this . did you try disabling the IPV6 from the network advanced configuration? Yes, I ‘d tried to uncheck ipv6 but still pinging ipv6 as [fe80::59df:730:eaf9:7a6%14] .. but still the same issue. Prior to the loopback installation , by default it is pinging ::1 , which is localhost ip for ipv6 instead of 127.0.0.1 (ipv4). Is there anything to be done on the system settings? why it is taking ipv6 by default? thankuuuuuu so much, This is really excellent article. Did your problem solved ? I am also facing the same issue it is taking ipv6. i followed all the stePs mentioned above but when i Ping “wrath”, i am getting request timeout as a resPonse. 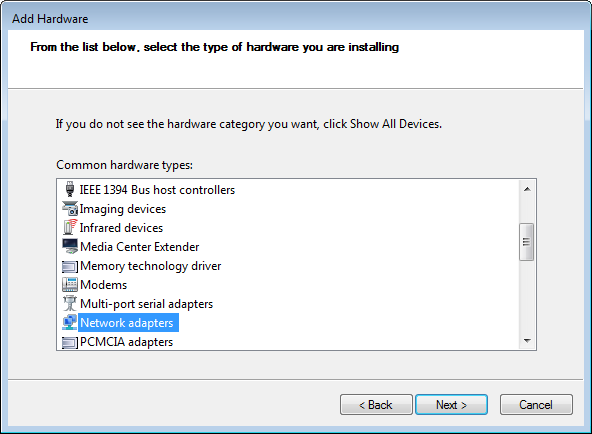 Please helP me to configure adoPter in windows 7. Windows documentation says not to set the Default Gateway. Oracle does not mention setting the Default Gateway. So how is it? The above commands should return the same output for hostname, hostname.domainname and ip_address. So why can’t I go past the nslookup test? I am sure my IP address is not registered on any of my 2 DNS servers. Any guidance on installing for Windows 10? Thank for sharing such wonderful message for everyone those who are suffered for the question.